The Bombing of the Boston Marathon will teach us many lessons in the days, weeks, months, and years to come. Our law enforcement, the media, and even the everyday citizen will benefit from the hindsight such an event offers over time. But will we benefit from the one lesson that can be taken away right now, only two days from the end of a manhunt that effectively shut down the ninth largest metropolitan area in the United States? The lesson is simple. However, it is not one easy to accept. It challenges our basic humanity and forces us to confront reality. The only ones that can truly keep us safe are ourselves. Shortly after the assassination of Officer Sean Collier at approximately 10:20pm Thursday April 18, six Watertown police officers engaged the brothers suspected of the bombing in a gunfight. The elder brother died in the exchange where maybe as many as 300 shots were fired between them. Shortly after, law enforcement officials quickly mobilized thousands of National Guard troops, FBI and other federal agents, as well state and local police. They also placed Boston in an unprecedented lockdown. The lockdown lasting nearly eighteen hours is estimated to have an economic impact of up to $1 Billion of lost revenue for the city. 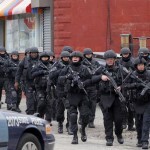 The cost of the additional police and military agencies is not yet known, but could easily exceed millions of dollars. Yet, all of those resources could not find the second suspect. He was eventually found by an ordinary citizen checking on his boat after the lockdown was lifted. David Henneberry knew something was wrong when the tarp on his boat wasn’t secure. After a quick inspection and remembering SWAT teams on his street before, he immediately knew the danger and notified the police. That’s right. Just after we had all been given the impression a cold blooded killer slipped through the largest manhunt on US soil, a guy out for smoke found him. Pretty comforting, huh? I’m not trying to poke a stick in the eye of law enforcement. I believe we have the best military and law enforcement in the world. It is because of their efforts events like the bombing are rare. However, they CAN NOT protect us all the time under every circumstance imaginable. It’s up to the individual American to defend his life and the life of his loved ones. We can sit back and interwebz lawyer the supposed police state and Fourth Amendment violations that took place during the lockdown. We can sit back and interwebz speculate the idea that police welcomed the opportunity for a “real life training opportunity” in preparation for an expanded police state. We can sit back and interwebz speculate over conspiracy theories. I choose to focus on what I know is true right now. I am the only one that can truly protect myself. I cannot depend on someone else for my safety. All the king’s horses and all the king’s men can’t protect me when they come again. Turns out someone who may have connections to the Boston Marathon Bombing was here on a student visa to study in Findlay. FINDLAY OHIO!!! Sources are reporting he is now free despite a deportation order issued the day of the bombing. Still think you are immune? Still think it can’t happen in your back yard? Still think the authorities can protect you? I am NOT buying into a conspiracy theory. Instead, I am trying to demonstrate that WE CAN NOT TRUST the authorities to protect us DESPITE their best efforts!